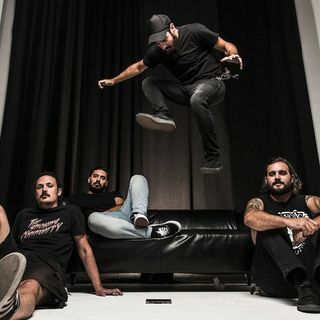 "It would be nice for the first time in Australia to be playing at a festival", declared Labros, drummer for Greece's 1000mods ahead of their April tour. "It always helps playing with a lot of bands. There's much more people in comparison with a headline show, but also we can't wait to get to all of the cities to play our own shows and try to find fans in each city." Being 1000mods first trip to our shores they don't know what to expect from music fans ... See More here, but the flipside of that is we are in the dark just as much. "Usually we try to play as good as we can at every gig", Labros explained. "It doesn't matter if we play in Athens in front of 3000 people or in Germany in front of 100. For us it's always the same. We try to play our best gig every night as heavy and as loud as possible and have a nice party with all of the people attending". In the full interview, Labros discusses how the tour came about, their performance at Mojo Burning as well as their own shows, what they expect from Australian audiences, how they classify their sound, the musical climate that gave birth to the band, upcoming music and more.